Best meal we had in the area. Amazing place that is worth the drive to McLaren Vale just for this meal. On a lazy Sunday we decided to go to a restaurant recommended by one of my colleagues called The Currant shed. 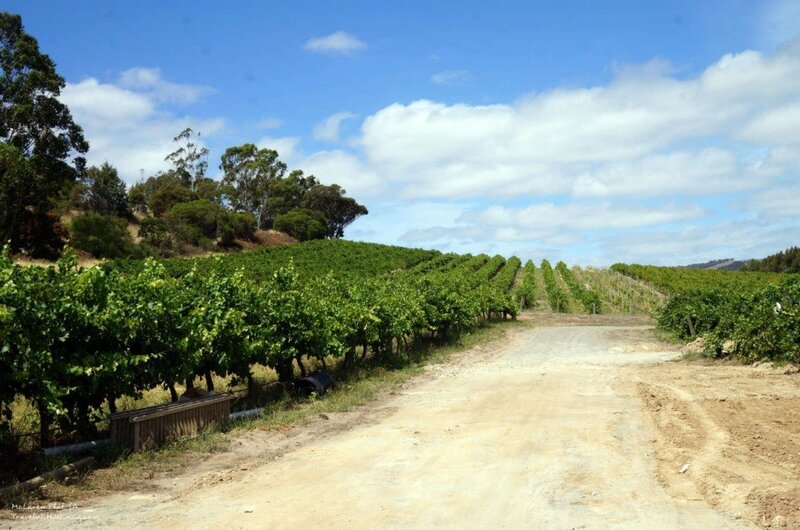 It’s located at McLaren Flat which next to the famous winery region of McLaren vale. The restaurant is located roughly fifty minutes away from the city centre. After a nice drive on a beautiful day we arrived at the small town and the restaurant is tucked away at the end of a winding road. The Currant Shed is a home to one of the first families in region almost one century ago. It is now a shed restaurant built in the middle of a vineyard. 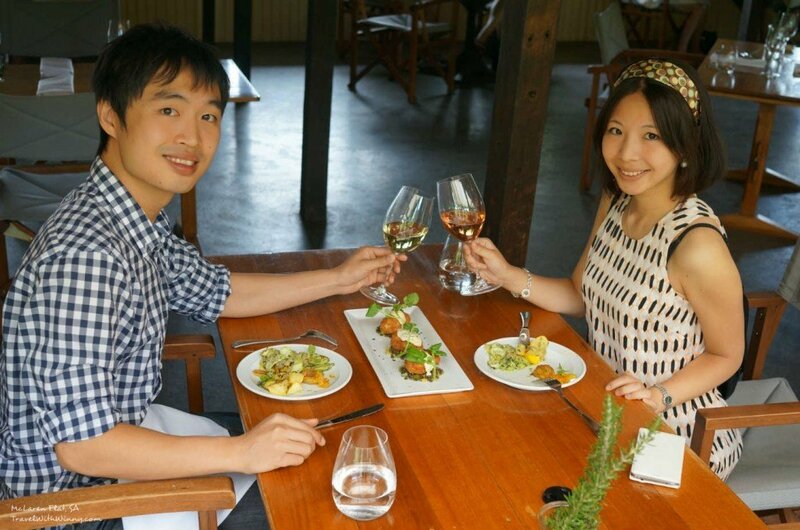 The place is beautiful with vines growing over the cover of the courtyard which leads into the main restaurant area. The Currant Shed from outside. 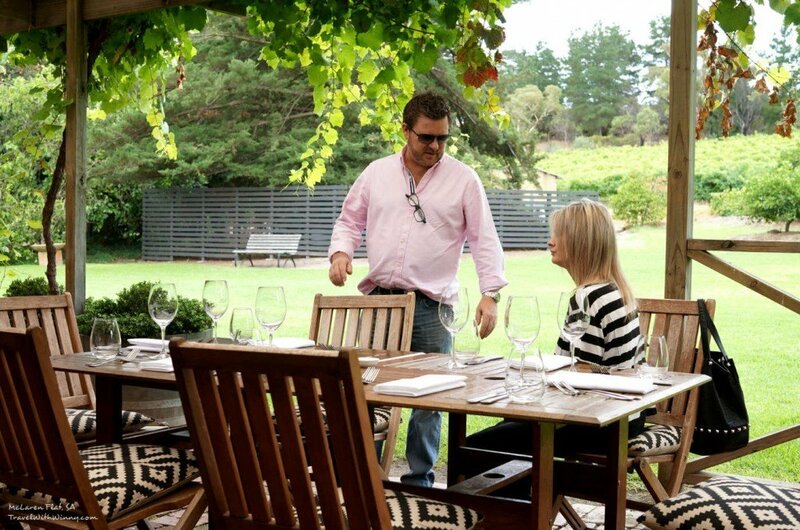 The restaurant has an open area that leads into the vine yard which is currently lush green. It was relaxed country paradise. 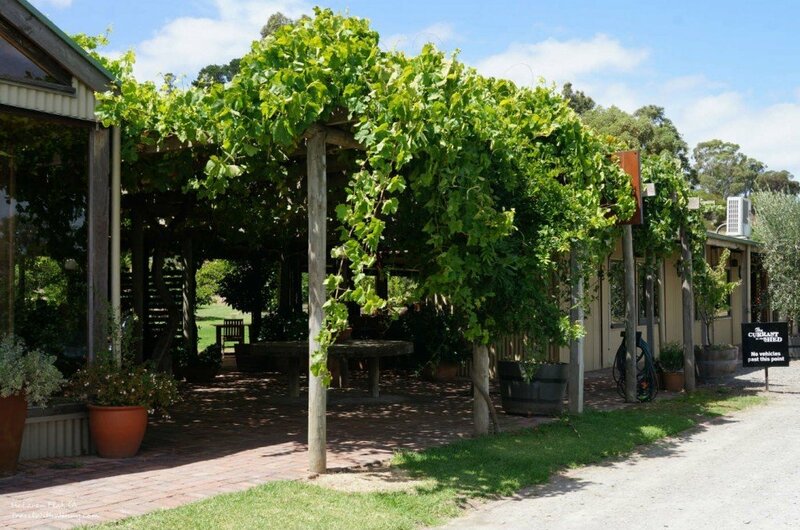 The Currant shed can also housed weddings in their beautiful restaurant. A seated wedding usually seats roughly 70 people and a stand up canapé can hold up to 120 people. The restaurant is usually packed out and needed to book in advance however we were lucky that the restaurant was not busy that day due to the tour down under happening in Adelaide city. We were seated on a two people table close to the outside area. It was an extremely pleasant day, the sun was shining and wasn’t hot at all. The two people table was well planned out. They were long rectangular tables where people can be close whilst seated opposite to each other and the food could be spaced out to either side. 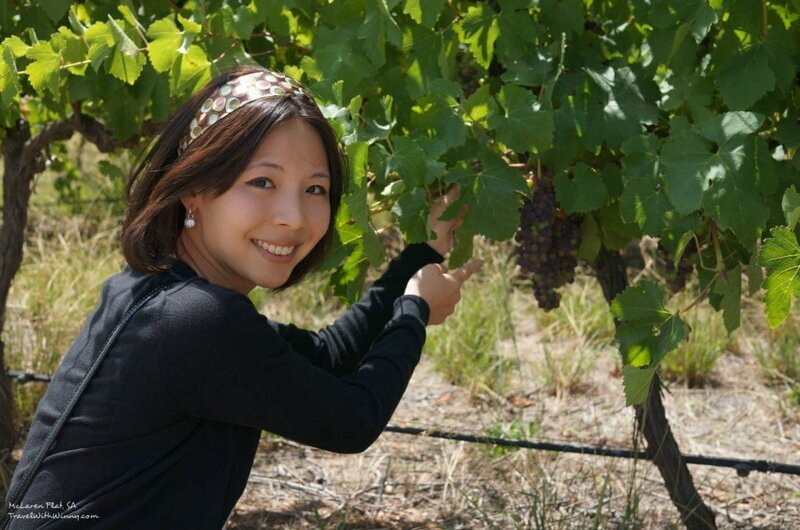 Since we were in the famous wine region, our food experience would not be complete without some famous McLaren Vale wine. Winny had the Spring Seed ‘Morning Bride’ McLaren Vale Rose and I had the Shottesbrooke McLaren vale Chardonnay. 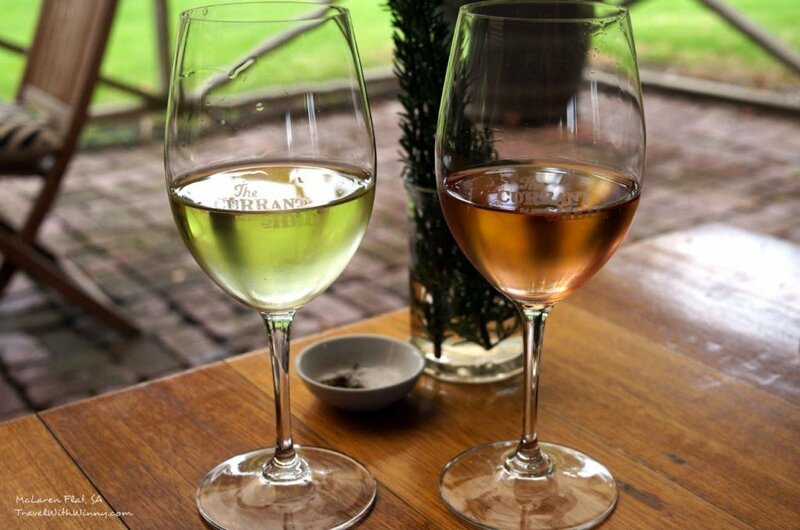 They were both beautiful wines. The service here was excellent. The waitress responded to our seat request promptly. They kindly explain every dish and they were extremely professional especially one of the older waitress with a thick French accent. She was very caring and made sure we were having a great time and having a enjoyable meal. It was a good feeling. The food here was excellent from the start. First dish was the Duck parfait which was served with bread and poached pear. The parfait was beautiful. Buttery on the outside, rich in the centre and it melts in mouth. We have had many pates recently and this is definitely one of the best. 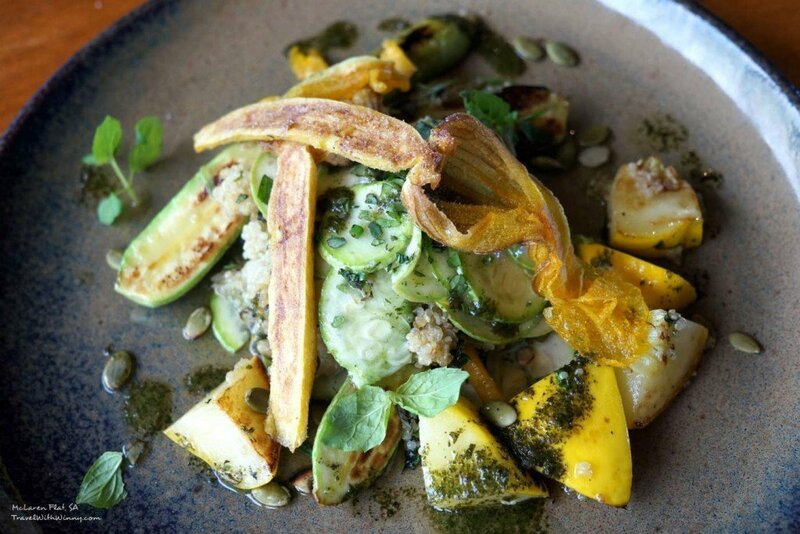 The following entrée was the zucchini flowers with assorted squash, raw courgettes, quinoa and tarragon dressing. It was a quite a refreshing dish, slightly oily but has very summary flavours of the vegetable sweetness coming through the savoury and tangy dressing that is infused into the quinoa. It was quite a delicious vegetarian dish. This dish would probably disgust most of you but it is my favourite dish at current shed. 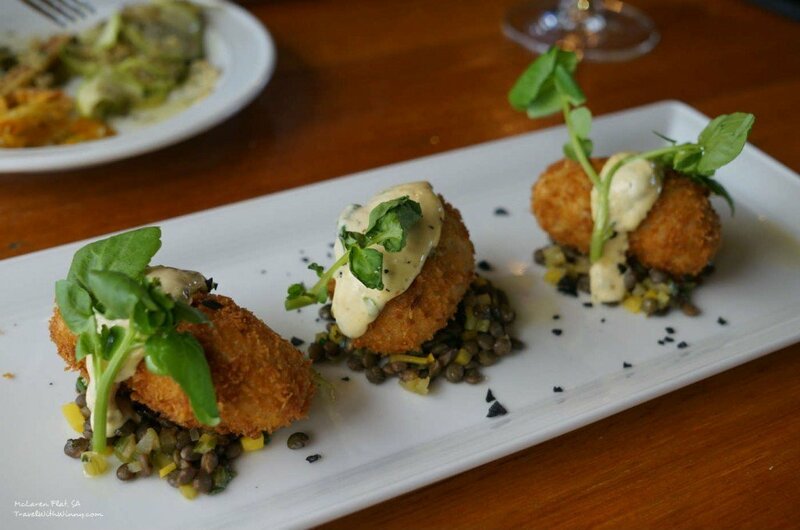 It was the Panko crumbed lamb brains with lentil salad, almond, preserved lime aioli and watercress. The lamb brains were soft, creamy and flavourful. It worked extremely well with the lime aioli sauce. The lentil and almonds were also delicious and evens out the creamy taste of the lamb brain. My mouth was swimming in paradise after each bite. It was a beautiful dish and I dare everyone who comes here to give it a try. Next up was one of their specials. 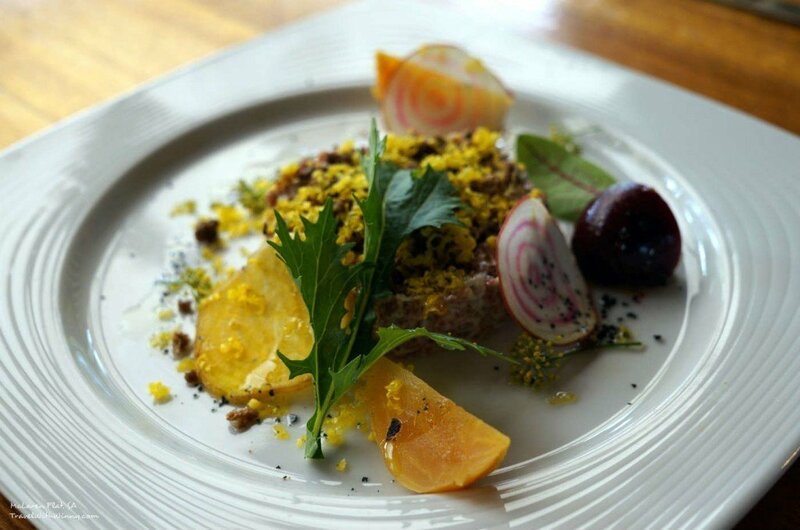 The dish was Venison tartar with confite/cured shaved egg yolk, rye crumb and fennel flower and beetroot. The venison tartar had a very strong mustard taste. Would have like the dish a lot more if they toned down the mustard taste because I personally would like the raw taste of the venison to come through a little more in the tartar. The confit egg was quite delicious on its own but when mixed with the tartar, the mustard taste covers most of the taste. It was still quite a delicious dish when taken in small bites but wasn’t our favourite dish. 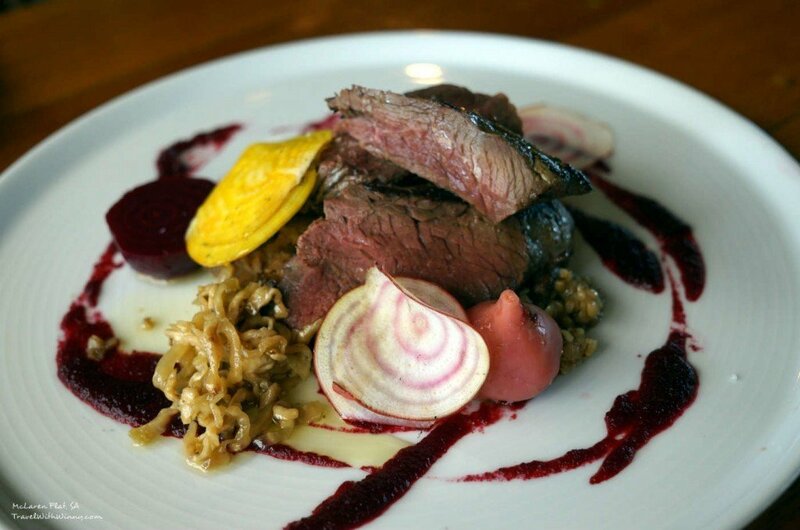 We had chosen one main and that was the Kangaroo loin with pickled eggplant, smoked beetroot purée and buckwheat risotto. The Kangaroo loin was very tender and cooked to medium rare as recommended and requested. The smoked beetroot puree mixed with the meat was a beautiful combination. The meat falls apart. It wasn’t like the usual toughness and earthy taste of kangaroo we have tasted in the past. The meat was chewy still but melts apart quite easily in the mouth. It was like the Wagyu of the kangaroos. 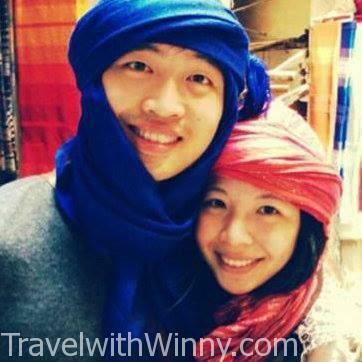 Winny did say that she still likes the earthiness in the meat. Without the earthy taste, the meat tasted more like a beef steak. Although we were so full by the end of the main, we could not leave without trying their dessert. 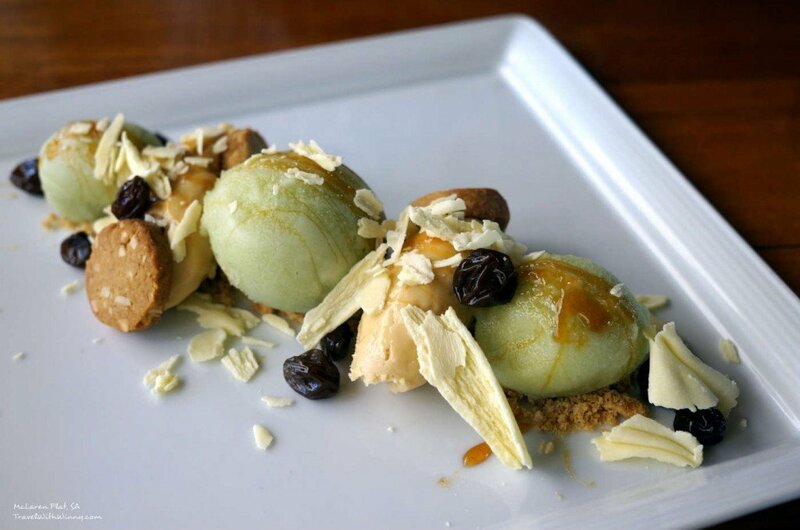 We tried the Celery and vodka sorbet with peanut butter mousse, peanut cookie crumb, white chocolate and muscatels. It was one of the most creative and delicious dessert I have tasted. I don’t quite like the taste of celery but I really enjoyed the sorbet. It was sweet but not sickening. 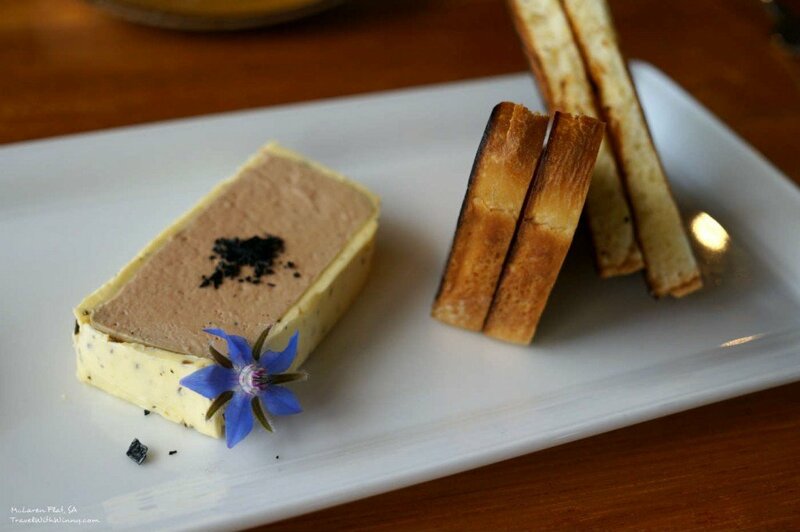 The peanut butter mousse was also to die for. I savour every bit of the creamy peanut buttery taste and it was a lot creamier and thicker than the normal mouse. The whole desert was delicious and I was quite disappointed that I don’t have a bigger stomach to try more desserts. We loved our experience at the current shed and couldn’t wait to share this experience. The place is amazing and worth the drive to McLaren Vale just for this one meal. Winny and I will definitely be back to try this place out again.